As we all know, Charles Babbage and Byron’s daughter, Ada Lovelace, were pioneers of the earliest and crudest computer technology, but later writers on science went one better and seem to have predicted most of the developments in telecommunications and digital technology that we are familiar with today. The personal computer and the Internet were accurately predicted by Murray Leinster ( writing as Will F Jenkins ) in his short story, A Logic named Joe ,in the March 1946 issue of Astounding Science Fi ction. There are only 3 copies of the March issue of Astounding Science Fiction on ABE at present. Considering how significant Leinster’s story is, £2.95 seems a very small price for the copy in Wiltshire, but the other two aren’t dear either. Copies of the novel are not expensive. At present there are two on ABE, one of which is described as having ‘ a clean, solid, unmarked and virginal spine and pages untouched by a reader’s hands ‘. It’s yours for $17.95. The technology behind the Internet and especially Wikipedia were predicted by visionary engineer Vannevar Bush in his article ‘ As We May Think ‘, which appeared in Atlantic Monthly July 1945. Because of the demand from geeks this item is expensive. A single copy of this particular issue is currently on ABE at a slightly risible $1500, whereas a half-yearly bound volume containing it can be had for $350 or $500. Early editions are quite numerous on ABE. 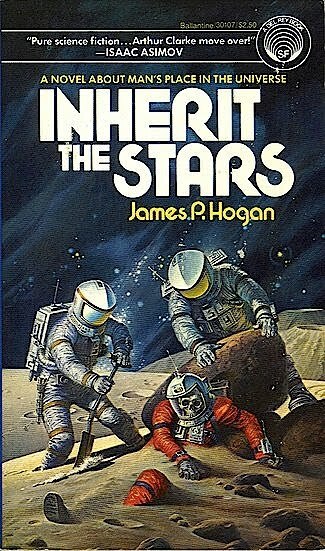 You can secure a good copy of the first American edition (1974) for $29 or less. 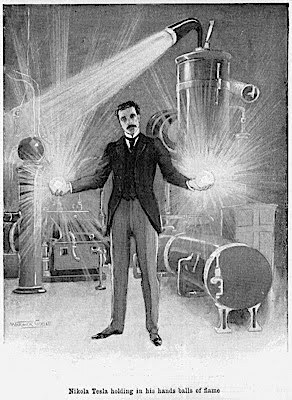 Strange genius Nikola Tesla wrote about an early Blackberry-like device in the October 1909 issue of Popular Mechanics. “ An inexpensive instrument, not bigger than a watch, will enable its bearer to hear anywhere, on sea or land, music or song…it will be possible for a business man in New York to dictate instructions, and have them instantly appear in type at his office in London, or elsewhere “. This American magazine was at the cutting edge of consumer gadgetry and there is a big demand for early copies. At present there are no very early issues on ABE, so you might have to settle for a reprint published by Hearst Magazines, who allow you to browse pages online. Alternatively, you could buy a large collection of issues, including the one for October 1909, from a guy in Canada who wants a very reasonable $200 for the lot. Sci-fi master Robert Heinlein described a Blackberry-like device in his novel Assignment in Eternity (1953). Paperback firsts of Assignment to Eternity are legion on ABE. Many cost only 1$. I phone technology was envisaged by H. G. Wells in When the Sleeper Wakes (1899) and The Sleeper Wakes (1910). Expect to pay little more than £20 for the revised 1910 edition on ABE, but the 1899 Sleeper, with its red boards, comes in at a lot more. Pay more for copies with wrappers. In his predictions for 1983 David Hadju envisaged i-phones in a late 1982 issue of the now defunct Video Review magazine. “Video-walkie-talkies …with micro-processors and the first flat screen display picture tubes. There’s nothing preventing the development of personal two-way TV transmitter receivers –except perhaps the FCC “. Copies of the magazine are common enough . Ken Olson, president of Digital Equipment Corp in 1977. I am tempted to buy one of the March 1946 issues of 'Astounding Science Fiction' with Murray Leinster's internet prediction - the only decent one is £20 and it's the Brit issue... On the subject of Tesla the pugnacious proprietor of a used bookshop in Portsmouth, NH, USA has a signed 1894 copy of his Inventions, Researches & Writings of Nikola Tesla in 'prominently' signed by him on the half-title page but in worn condition. Priced with crazed oligarchs firmly in mind, the chap wants $1 million. It has been there many moons. I predict this will sell at this price before the middle of the 22nd century. To put it in perspective 5 years back a canny dealer bought a 4 page signed letter from Tesla to George Sylvester Viereck praising him for his poetry and even enclosing some of his own. He paid $1140 at auction (Spink Shreve NY). At the same auction Tesla's signature on a card with original holograph envelope made $425. My congratulations on another very interesting post - this from one who usually turns his back on science fiction. 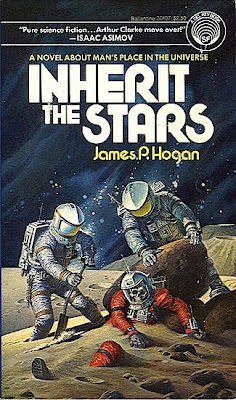 Sadly, I expect that anonymous bookseller's description of Inherit the Stars will remain with me for years. The very idea of "a clean, solid, unmarked and virginal spine" encourages guilt. Oh, how many have I deflowered? How many have I shared? How many have I sold? To be fair, I take special care not to warp spines... but it does happen. Shouldn't that be Stanislaw Lem rather than Vladimar .. ? .. al. Another fascinating piece - many thanks Robin, Sophie and Nigel!